After the unwarranted hype surrounding Apple’s iPhone, which won’t see the light of day for months yet, we now have a little intrigue over a similarly hybrid phone that never was and never will be. Nintendo’s spliced device, revealed this week in a US patent application, was first tabled in 2001 and not approved until last summer. The ‘Electronic apparatus having game and telephone functions’ was to include two processors, one for the phone and a dedicated one to power Yoshi and pals. 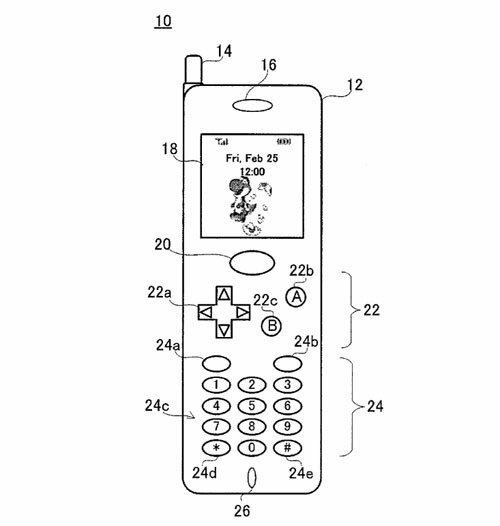 The patent application was filed with the United States Patent and Trademark Office by a group from Nintendo that included Satoru Okada, the general manager of research and engineering, so it clearly was a serious undertaking. Okada’s previous and subsequent work includes such notable hits as the Game Boy Color, Game Boy Advance and the Nintendo DS mega-smash. While it’s obvious that the Mario-phone will never be made – Nintendo has far too much at stake with its various handhelds to risk cannibalising sales of those by jumping into the shark-infested Japanese handset market – it would have been fun to see how the old-school gamers fared in the glossy new age of smoke and mirrors.